Two apparel companies have teamed up with Cotton, Inc.’s Blue Jeans Go Green program to create an innovative type of insulation made from recycled denim. Those who have installed traditional insulation are familiar with the small glass fibers which can cause itching and eye damage. Instead, Blue Greens Go Green insulation uses a cotton blend which is easier to handle and performs as well as traditional insulation. One of Cotton, Inc.’s first uses of the insulation was rebuilding some homes of Hurricane Harvey survivors. 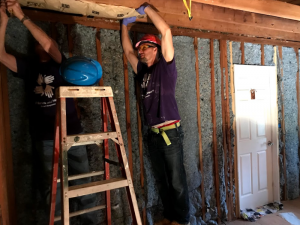 Recently, two truckloads of insulation were shipped to two groups aiding in the reconstruction: All Hands and Hearts and Sewa International. 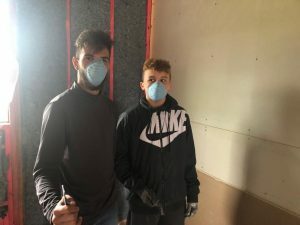 All Hands and Hearts focuses their construction on flood affected low–income homes in northeast Houston. The Blue Jeans Go Green insulation has been used in over 30 home reconstructions and has helped the organization overcome much of the complication usually associated with insulation installation. Sewa International works in Rosharon, TX, a small immigrant community 30 miles south of Houston. Rosharon saw widespread damage to homes and crop fields, the primary source of income for homeowners. Sewa has been hard at work for the past year and a half, aided by volunteers from around the country, to complete homes for residents who are also still struggling to re-establish their livelihoods. One survivor is Van V. whose house and four greenhouses were destroyed by Hurricane Harvey. Sewa International, with donations donated through Good360, was able to replace Mr. V’s home with an elevated house. His new home will withstand wind and flood damage better than his old home and allow him to focus on rebuilding his small farm. Without the partnership of our retailers, the completion of Mr. V’s home and hundreds like it would not have been possible. The insulation provided through Blue Jeans Go Green has proven to be a highly sought after and effective product in the Harvey relief effort. All Hands and Hearts, Sewa International, Good360, and many other organizations are extremely grateful for the creative minds who made this program possible. We look forward to implementing more innovative ways to build resiliency and make recovery sustainable.